Aerial Acquisition – G Squared L.L.C. Aerial photography is the base for many of the products and services offered by G-Squared. For this reason, we utilize only the highest quality camera systems available for your imagery projects. 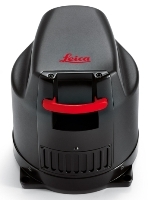 The camera system most commonly used to acquire imagery for ortho projects is the Leica RCD-30 medium format (pictured left) with forward motion compensation and a gyrostabilized platform. The camera system can be interfaced to GPS survey grade receivers, allowing for the simultaneous collection of raw GPS data. This information is later post processed and used in the aero triangulation process to aid in the reduction of costly field control. Also available is the Z/I Imagery Digital Mapping Camera (pictured right). G- Squared’s Certified Photogrammetrists will work with each client to determine the best camera system to meet the requirements of each project. These camera systems are mounted in either single or multi-engine aircraft specifically modified for aerial photography. The twin engine aircraft is preferred for acquisition of photogrammetric mapping applications because it covers a large amount of terrain and the time from base or between project sites is minimal. The single engine is most suited to smaller projects and projects that are nearer to the base airport. Most single engine platforms have had the exhaust modified so that it does not flow between the camera and the ground, which could cause a reduction in image quality. Natural color films are available in either positive or negative materials. The positive films allow for the direct interpretation immediately after procession without further products such as contact prints or enlargements. Color negative films are the most common. While color is more pleasing to the eye and allows for better interpretation, black and white films provide finer resolution. False color infrared film is a film specifically designed for the plant sciences. Its sensitivity to reflected infrared make is ideal for not only evaluating the different types of vegetation, but also in finding stressed and diseased areas. As an added benefit to the photo-interpreter, shorelines and water features are easily determined using this film type. The most common film used for the acquisition of large amounts of data are the black and white emulsions. These range from the high resolution Kodak Panatomic-X to the fast speed Kodak Double-X. Many of these black and white films have an extended red sensitivity to help reduce the effect of haze in the atmosphere, thereby improving the image quality. The decision to use black and white vs. color considers accuracy, end product use, cost, and interpretation potential. G-Squared can assist you in the evaluation of these factors. 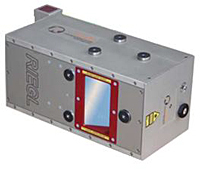 G-Squared also has available a Riegl 680i 400Khz LiDAR sensor (pictured left) for high-accuracy topographic mapping. LiDAR stands for Light Detection and Ranging and is a remote sensing technique that uses light in the form of a pulsed laser to measure ranges to the earth’s surface. 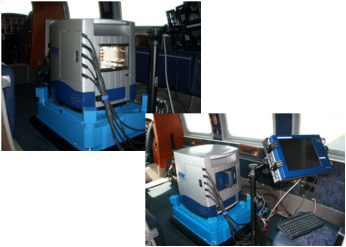 These laser pulses, combined with other data recorded by the airborne system, generate precise three-dimensional information about the shape of the earth and its surface characteristics.